The holidays are upon us so you know what that means, right? Well, these days it often means rushing, stress, and debt.....grrr! But once upon a time, when life was more simple, the Christmas season also meant ALL the old time Christmas cartoons and movies were coming on television and, since they only aired once annually back then, you wanted to be certain not to miss one! Well , I didn't want to miss one, but that's me. Frosty, ️Rudolph, A Christmas Story, It's a Wonderful Life, A Christmas Carol, The Grinch, just to name a few. I can remember waiting all year to watch these! When I would see the commercial advertising the date for one to be played I would dedicate it to memory and be certain to be sitting in front of the television at start time. 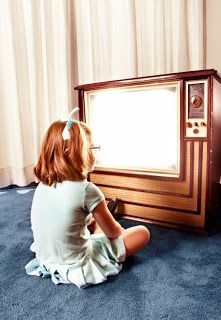 I was always sitting too close to the television set (the ones with the big back) my mother or grandmother would always yell to "Scoot back! That'll mess your eyes up!" I never listened, of course, but to this day I still have 20/20 vision. Some superstitions just never die I suppose or maybe I maintained good vision for always eating my carrots. Anyway, it was an exciting time for me each year to watch these shows and I was sure not to miss a single one. Funny how things change once you have to start "adulting" huh? My only struggle back then at Christmas time was whether or not Rudolph the Red-Nosed Reindeer was airing at the same time as Frosty the Snowman or the Grinch on a different channel. You had to pick just one as we had no DVR or any such thing. So, I have picked out four of my favorite old time Christmas cartoons/movies to share with you (I'm going to separate them into four parts and share them throughout the month). Maybe you loved them as well! Many, or all of them, still air each year to this day and not just once annually but many times during the Christmas season. Last year, I even noticed one channel played a marathon of the Christmas story all day long! Most, if not all, of these cartoons and movies told very special and meaningful stories. I think we will start with Rudolph the Red-Nosed Reindeer. So, grab your cocoa and let's go! First released in 1964, this cartoon was fifty-five minutes of pure joy for me. It was narrated by Burl Ives (Sam the Snowman). Firstly, Rudolph was born with a glowing nose and Santa tells Rudolph's father that he will not allow him to be part of his sleigh team with that "nose". This shames Donner (Rudolph's father) so he decides to cover Rudolph's nose so that he can be a part of the reindeer games. This covering makes Rudolph sound like he always has a bad cold. After a year of being in disguise Rudolph's fake nose covering falls off, during some horse play, exposing his glowing nose and all the other reindeer start making sport of poor Rudolph for "being different". However, Rudolph still has a friend in "Clarice" a female deer whom he was smitten with. But her parents forbid her from talking to Rudolph and, feeling alienated, he decides to run away. He meets an elf (Hermey) whom had lost his job because he wanted to be a dentist instead of a toy-maker. They bond after discovering they both have something that makes them unique so the two misfits decide to set off to be independent together. They meet an Abominable Snowman (Bumble) who hates Christmas and eats reindeer but they escape from him. Later, they meet a prospector named Cornelius whom, even though he claims to be the greatest prospector of the north, never manages to find any silver or gold that he seeks. The trio flee to an island of abandoned toys with "idiosyncrasies" (the island of misfit toys) the island is ruled by a winged lion named King Moonracer. King Moonracer allows them to stay just one night on the Island in exchange for finding homes for the misfit toys. Rudolph leaves the island and his friends in the night to keep from endangering them of being found by the Abominable Snowman because of his glowing nose. He returns home about a year later after not being able to find a place where he is accepted for who he is (glowing nose and all). Rudolph arrives home to find his mom, dad, and friend Clarice gone. Santa tells him they had gone to look for him. He sets out to find them & rescues them from the abominable snowman whose been holding them captive for quite some time. Finally, everyone returns home where a major snow storm threatens Christmas . Santa decides he must cancel Christmas because he can't see through the storm until he realizes that Rudolph can lead the team with his glowing nose! So, just because we are all different, some of us in more extreme ways than others, we should never ever make anyone feel less. We all fight our own battles daily and, as you see in this story, something that you ridicule of another may very well be being used to humble you or others. What everyone thought was bad ended up being the greatest thing for everyone that Christmas!